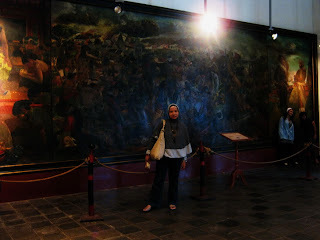 This time, I’ll share a little about things that we saw inside the Fatahillah Museum. We only had 30 minutes, so it’s just a quick tour. I can’t give a good description here as I have no chance to take notes. 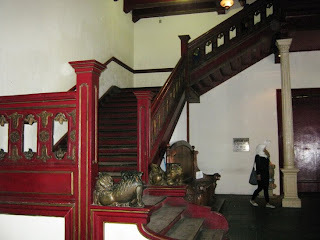 As a museum, it provides the historical background of Jakarta. 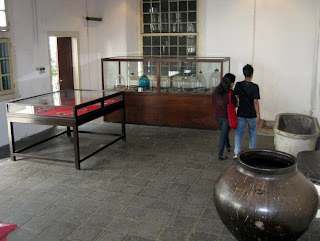 According to the records of The Culture and Museums Department of Jakarta, this museum has 23,500 collections. In the 1st floor we can discover lots of collections of antiquities and porcelains, VOC symbol statue, archeological discovery from prehistorically era, earthenware vessels, statues, and ancient inscription. 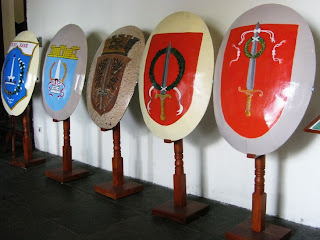 There are also many display objects such as traditional Betawi kitchen, cigarette stall, becak (pedicab), meatballs cart, etc., which are symbolize the Betawi culture. Betawi is ethnic culture of Jakarta that was born and bred for generations in Jakarta for hundred of years. 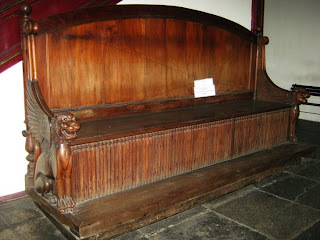 In the 2nd floor, there are many of antique furniture used by the Netherland leaders of Batavia. In this floor we can find large windows facing to the lawn. Beside one of these windows there is a written plate told that through these windows, the leaders of Netherland Government gave their orders to execute criminals by hang in the middle of the square. There are many rooms inside this museum; we didn’t enter them all. One of my favorite spots inside the museum is the room with the very wide hanging painting on the wall (3x10 m). This art work was created by S.Sudjojono to describe the battle between Sultan Agung (the third King of Mataram kingdom) and J.P. Coen (VOC Governor-General). aku pernah kemusium itu saat masih duduk dibangku sekolah dasar, dan banyak manfaat yang aku dapatkan dari sana. 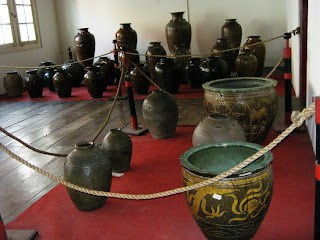 Here in Davao we only have a little a museum, at least we have a small one.. interesting artifacts Lina.. I had been dying to buy one of those giant planters (is that how you call it?? made out of clay or something. Nice place there, I have never been to a place like that. It's really nice that you can take pictures. Most of the museum here don't allow taking pics. More Nostalgia, thanks for playing. See ya next week! museums are nice place to visit. thanks for sharing us the pictures. thanks for taking us Lina...antiques are exquisite! Looks like a beautiful place to visit. Great photos.